The Ultimate Fighting Championship (UFC) 299 will be on October 6, 2018 at T-Mobile Arena in Las Vegas. Of all the matches that will happen tomorrow, it is the face-off between Khabib Nurmagomedov and Conor McGregor that sports enthusiasts are looking forward to the most. Online bookies have set their odds as well. Bet365 gives Khabib 5/8 odds and Conor 13/10. Meanwhile, Sky Bet favors Khabib set at 8/13 odds against Conor’s 13/10. A lot of sports lovers are tuned to this upcoming fight mainly because the combatants have outstanding records. McGregor stands with 21 wins and 3 losses while Nurmagomedov stands with 26 wins with no losses. What makes the fight more interesting is that both have different approaches in combat. McGregor’s acquisition of the black belt rank in Brazilian jiu-jitsu helped him in winning his fights. He is even now one of the most popular fighters in UFC. Meanwhile, Khabib Nurmagomedov is known for being an undefeated smashing machine. He prefers to use straight-forward charges. He also uses his advantage as a Sambo athlete by using his grappling and wresting techniques. In addition, Nurmagomedov is known for his brutal ground strikes that lead to arm triangles or rear naked chokes. 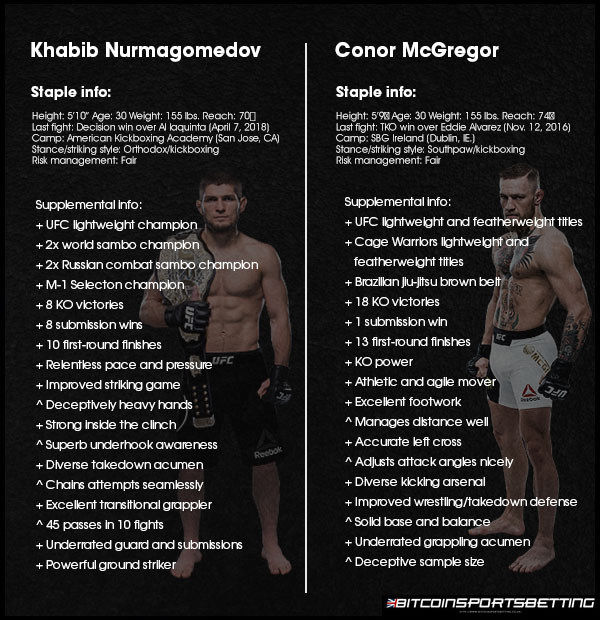 The difference of both players in skills and combat techniques makes them the best rivals in the history of UFC. With 26 wins and no losses, Nurmagomedov has been a fan-favorite of UFC supporters. Among those 26 wins, 8 were KO victories, 8 were submission wins, and 10 were first-round finishes. Such set of victories give Nurmagomedov the advantage against McGregor. The upcoming fight will be McGregor’s comeback after 2 years. According to UFC president Dana White, the returning fighter decided to go on a hiatus to focus on his family. But it is undeniable that he also spent a lot of time preparing for his comeback match. Tomorrow’s fight will determine if Nurmagomedov will maintain spotless record. Or will McGregor’s comeback change the undefeated champion’s winning streak? The most popular encounter of the two started was the infamous bus attack that happened back in April 2018. The attack ensued after the UFC 223 press event. Nurmagomedov was said to be the target for the attack involving McGregor and his team. Videos of McGregor lifting a hand trolly and smashing the bus window eventually went viral. The chaos ended with a UFC employee ending up in the hospital along with two injured fighters. UFC President Dana White was disappointed with what happened and said that a warrant of arrest was filed against McGregor. McGregor did not go to jail although he pleaded guilty for the attack. But he was charged to perform community service and attend anger management classes. The intriguing attack gained the attention of UFC fans and even sports enthusiasts around the world, with some expressing how much they anticipate the fighters’ official match. Alongside these reasons a lot of people are looking forward to the match is the fact that the two competitors have been keeping the fans entertained with their insults thrown at each other. But the witty comments and other issues revolving the two may officially end after the UFC 299 match on October 6th.